"Confederate General Price made his headquarters here the night of October 22, 1864. His generals convinced him to start south but he refused to abandon his 500-wagon train of war booty. General Shelby's Division camped near Forest Hill Cemetery. General Marmaduke was at Byram's Ford and Fagan's Division and the train were on the west side of the Blue River one mile south of the ford. Benteen's Union Brigade fed their horses west of here at noon on October 23rd." Directions to Stop #19: This tour stop is located near the southwest corner of 63rd Street and Swope Parkway. Turn around and head back to 63rd Street and turn right (west) off Elmwood Avenue. After about one half of a mile, turn left (south) onto Swope Parkway. The marker will be just on your right in a school's circle drive. This tour stop is located in Kansas City, Missouri 64130. 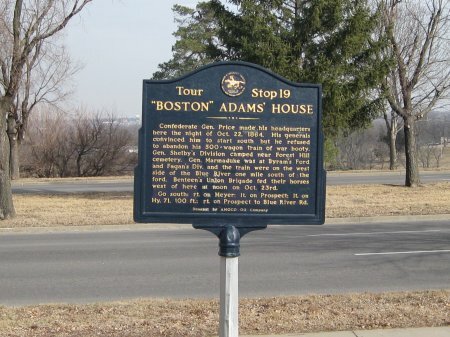 Description: After crossing the Big Blue River on October 22, 1864, Price made his headquarters in the "Boston" Adams' House at this location. This is where he devised his plan for Sunday, October 23rd. Remember, Price was in a dangerous position. His army had the enemy on two fronts. Shelby and Fagan (minus Cabell's Brigade) were deployed along a five mile front on the south bank of Brush Creek from the state line to the Big Blue facing the Army of the Border. Marmaduke's Division was along he west bank of the Big Blue around Byram's Ford facing Pleasonton's Division. Price's 600 wagons and 3,000 head of cattle were still east of the Big Blue river but moving southwest towards Little Santa Fe (Tour Stop 22). The wagon train was guarded by Cabell's Brigade. Price was worried that either Pleasonton could swing south and capture his wagon train. Price chose to save his wagon train by attacking at dawn on Oct 23. Price had his headquarters at the Boston Adams House. He wrote his orders here. Cabell was to move the wagon train down the Hickman Mills Road until he could turn southwest to Little Santa Fe. Shelby and Fagan were to attack at dawn and defeat Curtis and the Army of the Border. Marmaduke would keep Pleasonton from crossing the Big Blue. Price spent the night at this location before moving to join General Jo Shelby near 55th Street and Pennsylvania Avenue (Tour Stop 8).